Foosball Fun + Beer Too! You must be a member of the Mexico City Beer Enthusiasts Group to attend this activity. Would you like to join this group? 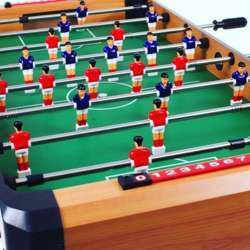 Join us on Saturday, February 16th for Foosball Fun! Whether you are a beginner or an expert, we are looking for some friends to join us in our first ever Foosball and beer event at Protected content At this unique spot, you will find beers inspired by Metro stations around the city, each with their own unique story. The brewers have creatively worked hard to create something special through their one of a kind brews. The venue is also offering a special meal deal for our enthusiasts, a burger and house beer for $160. If you are in the mood for more beer sampling, our group will also receive 2x1 house beers for the evening. Looking forward to some Foosball Fun (and always for some tasty beers too)!